A majority of Swiss voters believe Brexit will bring economic benefits and feel that Switzerland will have a stronger bargaining position vis-à-vis the EU. Party affiliation and age play a negligible role in this assessment. These findings come from a survey conducted by gfs.bern on behalf of Credit Suisse. The United Kingdom's Brexit decision will bring economic and political benefits for Switzerland. This opinion is held by the majority of participants in a representative survey carried out by the gfs.bern research institute as part of the Credit Suisse Worry Barometer 2016. In fact, 55 percent of respondents think that benefits are likely or even see major benefits for the Swiss economy. 54 percent believe Brexit will have a positive impact on the negotiations between Switzerland and the EU. Optimism is not only apparent among those who are fundamentally critical of the bilateral agreements, but also among those who support the agreements. "In the so-called Brexit referendum, the United Kingdom voted to leave the EU. What impact will this have on the Swiss economy?" "People are highly aware that Brexit has economic and political consequences for Switzerland," says Lukas Golder, co-head of the gfs.bern research institute. This is shown by the unusually low number of participants who had no opinion about Brexit's economic and political consequences for Switzerland (9 percent and 8 percent, respectively). The survey was conducted over a three-week period, and also shows that, on the whole, the level of optimism rose considerably as more time passed after the referendum. In contrast, a minority of at least one-third of respondents see the situation differently: 8 percent of respondents see major disadvantages for the Swiss economy, and 28 percent expect at least potential disadvantages. In terms of the negotiations between Switzerland and the EU, the negative values are at a similar level: 9 percent see major disadvantages and 29 percent anticipate potential disadvantages. "And how will the UK's decision affect Switzerland's EU policy? What impact will this have for Switzerland's negotiating position vis-à-vis the EU?" Interestingly, a predominantly optimistic attitude is evident among respondents irrespective of their party affiliation or general political slant: 54 percent of SP (Social Democratic Party) voters, 53 percent of CDP (Christian Democratic People's Party) voters, 59 percent of FDP (Free Democratic Party) voters, and 63 percent of SVP (Swiss People's Party) voters see positive economic consequences for Switzerland. Therefore, approval on the political right is only slightly higher than on the left. The most critical group consists of those without any party affiliation, where the optimists make up 48 percent of the total. 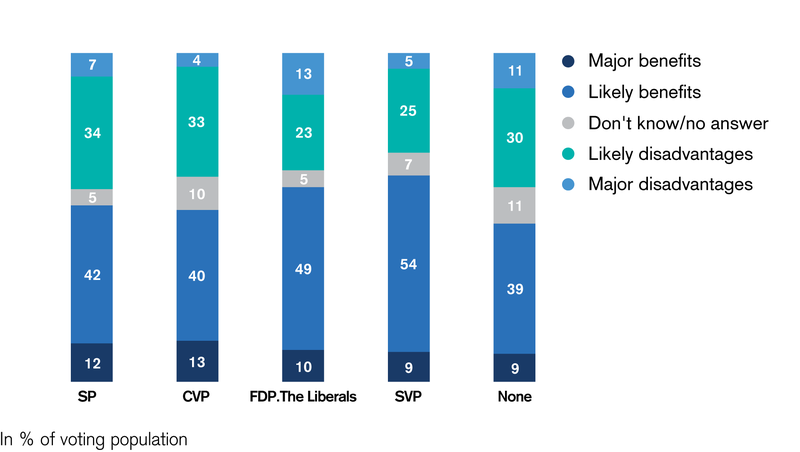 In addition, regarding the impact of Brexit on Switzerland's position to negotiate with the EU, views are surprisingly similar across the party spectrum: 51 percent of SP voters see major or potential benefits, while this figure is 43 percent for CVP, 58 percent for FDP, and 57 percent for SVP voters, and 41 percent for voters who are not linked to any party. "It is surprising that party affiliation does not reveal any significant differences, since optimistic opinions at the time of the vote were more apparent on the right of the political spectrum," says Golder. 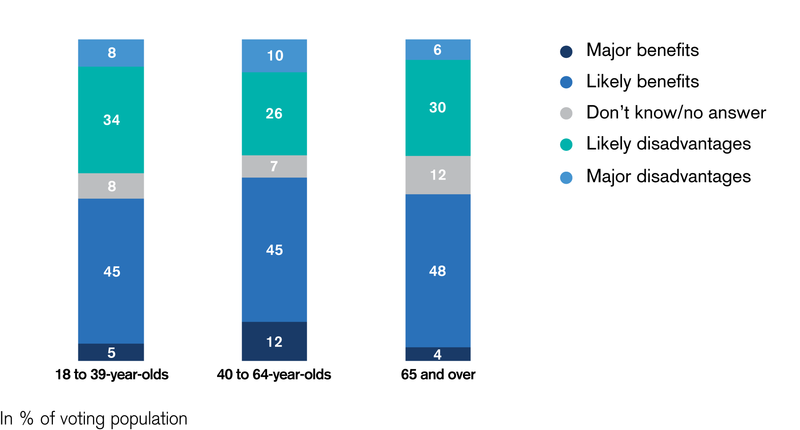 The differences according to the respondents' age are of particular interest, because the consequences of the United Kingdom's decision are of a long-term nature. While even here, no major differences are apparent, younger people are slightly more pessimistic on the whole. However, even in the youngest group of respondents (18 to 39 years), 55 percent think there are major benefits or likely benefits for the economy, and 50 percent in terms of negotiations with the EU. In the case of the 40-64 year-olds, 57 percent assess both of these aspects to be positive overall. For those aged 65 and over, there were slightly fewer positive assessments (52 percent), and also the most abstentions. The Credit Suisse Worry Barometer has been collating data on the biggest worries of the Swiss population, their confidence in key players from politics and business, as well as on questions of identity since 1976. The participants were asked about Brexit as part of the survey for the 41st Worry Barometer. A total of 1010 Swiss voters took part in individual interviews in July 2016. The Credit Suisse Worry Barometer 2016 will be published on November 30, 2016.